INDIANAPOLIS, IND. - (@TheComedyNews) - In front of a capacity crowd of 257,325 spectators, English driver Dan Wheldon won the Indianapolis 500 car race this afternoon, only to go missing immediately following the race----presumably due to his lactose intolerance. It has been tradition since 1933 that the winner of the Indianapolis 500 drink a bottle of "victory milk" as they accept the victory trophy. Although the winners have the option to drink whole, 2%, or skim milk, there has never been any lactose-free milk offered to the winners. 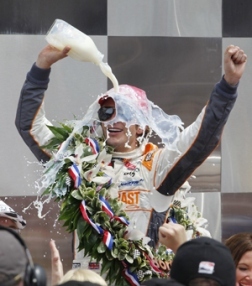 Unfortunately for Dan Wheldon, he joins a short list of lactose-intolerant Indy 500 winners. It became apparent that Wheldon was uncomfortable on the victory stage when he started chugging the victory milk and clutching his abdomen. As he started to writhe in discomfort, Wheldon started dousing himself with the milk, likely in an effort to avoid drinking any more, and to appease the raucous car racing fans watching on TV at home. "Yeah, we haven't seen 'em since he was on the victory stage," described 4-time Indy 500 winner AJ Foyt. "He looked like me when I had just won the race in 1977. I took two big gulps and then... woosh! Right to the stomach it went to wreak havoc. Poor guy." Wheldon was absent from his victory party, but he did, however, update his Twitter page during his absence: "Ughhh, crampy. These weren't the fireworks I was expecting." It is rumored that once Wheldon emerges from the bathroom that he will get an offer to be an official spokesman for Lactaid.